The chalice is one of the most important vessels of the Catholic church. It contains the wine consecrated by the priest during the service of Mass. 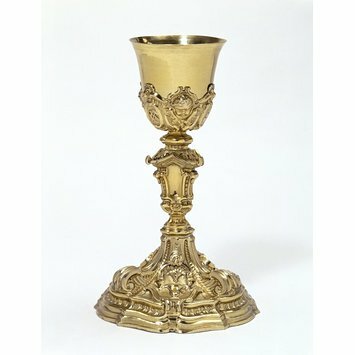 In Catholic belief the wine miraculously transforms into the blood of Christ during this service, so chalices were usually made from precious metals, to reflect the precious status of their contents. This example was made about 1700-1730 in Rome, the seat of the Papacy, and reflects a contemporary taste for richly decorated church silver. The ornament consists mostly of scrolls in high relief, with winged cherub heads on the bowl and Instruments of the Passion (objects associated with Christ's Crucifixion) on the base. 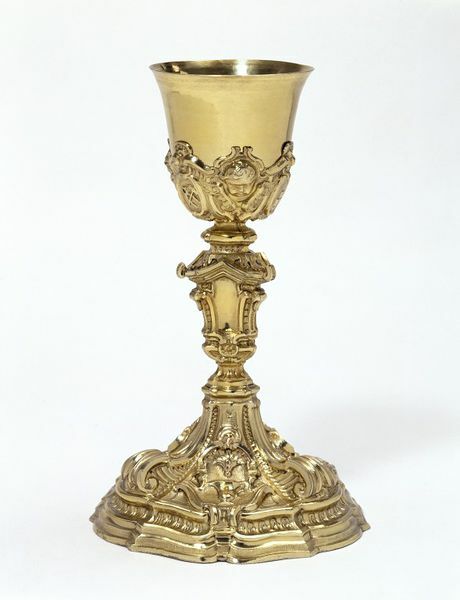 Silver-gilt chalice, the base, stem and lower part of the bowl elaborately decorated with scrolls in high relief, and with winged cherub heads on the bowl and Instruments of the Passion (objects associated with Christ's crucifixion) on the base. The image and message of the reinvigorated Roman Catholic church were actively promoted through dramatic architecture and furnishings. Throughout the 17th century new churches were built in the grand Baroque style. Their sumptuous interiors were complemented by elaborate monstrances, candelabra, sanctuary lamps and censers. Awe-inspiring altar silver drew the eyes of the faithful towards the Eucharist. A chalice was used during the Mass to serve the consecrated wine. This example was made in Rome, the seat of the Papacy, and reflects the contemporary taste for richly decorated church silver. The ornament consists mostly of scrolls in high relief, with winged cherub heads on the bowl and the Instruments of the Passion (objects associated with Christ’s suffering and Crucifixion) on the base.